President-elect Obama's swearing-in Tuesday will involve what's almost certain to be the largest security operation of any inauguration. It will assuredly be the biggest security challenge since 9/11, observes CBS News correspondent Bob Orr. Thousands of police officers, federal agents and military personnel will be assigned to keep Mr. Obama and other dignitaries safe. And a record crowd, perhaps two million-strong, is expected to flood Washington to witness the historic swearing-in of the nation's first African-American president. Law enforcement officials are vowing to keep everyone safe, saying they have the plan, tools and manpower to do it. Washington will be locked-down, with river and air patrols, bomb-sniffing dogs, and undercover officers looking for anything even hinting at a threat. "More than anything," Secret Service Agent Malcolm Wiley says, "more people in Washington means that we need more resources." Those resources include 20,000 law enforcement officers who'll be focusing on a three-and-a-half square mile secure zone encompassing the Capitol, the National Mall, and the White House. 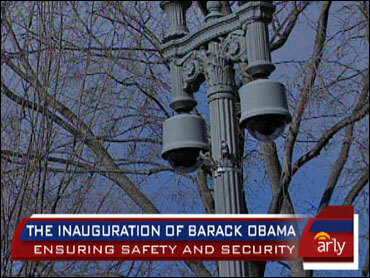 People closest to the swearing-in ceremony and those along the parade route will be scanned by metal detectors, and more than 5,000 surveillance cameras will pipe-real time images into security command centers. In addition, the FBI is reviewing intelligence. "We're asking our agents and our partners to go back, re-contact sources, to ensure that we've scrubbed and re-scrubbed every potential threat that we have," points out Assistant FBI Director Joseph Persichini. Homeland Security Secretary Michael Chertoff says there's no known credible threat but, "You have an incoming president, an outgoing president, Congress, cabinet, Supreme Court justices in one place -- that's always an attractive target, and we're in a wartime environment." For security officials, it's about striking a balance. "The one thing that we really want to make sure (of)," says Secret Service Director Mark Sullivan, "is that security is not the focus of this event. The focus of the event is the inauguration of our 44th president." Sullivan admits he's aware of critics who say all the planned security will be overkill but, he's not apologizing, saying they're taking no chances, and he'd rather listen to criticism than explain why something went wrong on Inauguration Day.